Make Heroes of the Storm Lag Free in Your PC. Heroes of the Storm is a multiplayer battle arena game which allows people to connect with each other to compete. The game is beautifully designed, and extremely action oriented. For this reason it’s important to have a consistent frame rate across the gameplay to enjoy the game. However, recently many people have experienced some lags while playing the game. This article explains how to get rid of such lags for having a smooth frame rate throughout the game. Optimize Heroes of the Storm. Most of the games out there are not optimized for older versions of the Graphics Driver, thereby showing poor performance when an older version of the Graphics Driver is being used. It’s recommended to update the graphics driver to the latest version to get rid of the lags or at least get a consistent frame rate across the gameplay. It’s recommended to download the driver directly from manufacturer instead through Windows Updates. Locate Option 2 and click on Graphics Drivers to initiate the scan. The scan will automatically scans the system for the relevant driver and download the latest version for it. Since it makes use of Java for scanning the system, it’s recommended to use Internet Explorer instead of Chrome. 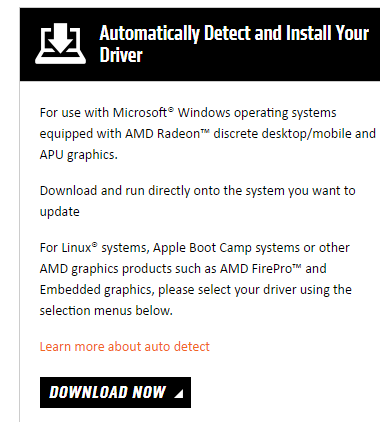 Locate the Automatically Detect and Install Your Driver option and click the DOWNLOAD NOW button to begin downloading the relevant driver for the installed Graphics Adapter in the system. Usually the game updates itself unless it’s manually overridden. Just like with other games released by Blizzard, Heroes of the Storm uses the battle net desktop client to download updates. For this reason it has to be configured properly so as not to cause any disruption for updates. Make sure the game is installed properly. 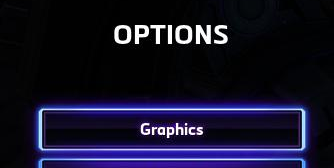 If this is the case indeed, Heroes of the Storm’s icon is visible in battle net client. Now click on the luminous icon located at the top left corner of the client, then click Settings. Now click Game Install/Update to access the update options. Locate the Automatic Updates section. Now select either Apply latest updates or Game specific settings. If you opt for the latter option, follow the next step as well. Select LATEST UPDATES for Heroes of the Storm. Also, make sure LATEST & FUTURE UPDATES option isn’t selected as it isn’t known to contain stable updates. Save the changes exit from the client and allow it to update the game automatically. Make sure the computer is connected to the Internet as well. Since Windows operating system is used on laptop computers, it uses this special feature which has been around since the times of Windows Vista to help conserve power consumption. However, this setting isn’t really needed on desktop computers, as they are always connected to the AC power. In fact, leaving the default option may give rise to problems such as slowing down certain applications. Hence it’s strongly recommended to turn it to Maximum Performance. Locate and click on Power & sleep. Now select Additional power settings under the Related settings heading. Check High performance to cause the computer to use its full power without giving any consideration to power consumption. Since turning on this option will make the computer to consume more power, it’s advisable to use this only during gameplay. 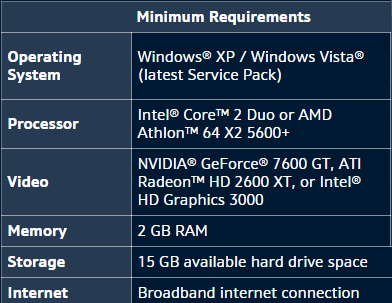 First make sure the system on which the game is about to played meets the following requirements (see the graphic below). If the system isn’t equipped with a Dual Core Processor released within the past few years, it may not possible to enjoy a smooth gaming experiences. Although the RAM required is stated as 2GB, you will definitely need 4GB of RAM if Windows 10 x64 is being used, for getting a decent frame rate. For the Graphics Adapter, anything above 7600 GT is sufficient, but it’s recommended to use a Graphics Adapter that was released recently for getting a good frame rate across the gameplay. As a matter of fact, latest Graphics Adapters are complimented very well by latest drivers, whereas older ones tend to experience problems with latest drivers. If everything is in the right order, but the game is still struggling, dive into Graphics Settings and reduce some of the options until the game starts showing at least 30 FPS during gameplay. Press Ctrl + Alt + F keys to view the frame rate of the game. The statistics for the game will then be displayed in the top-left corner of the screen. Navigate to OPTIONS and then Graphics, as seen in the following screenshot. Adjust both Graphics Quality and Texture Quality, depending on the performance of the hardware installed in the computer. If the hardware installed in the system is weak, set the settings to lowest possible, otherwise keep it to either Extreme or Ultra.